Our Olive Pit Traditional Balsamic Vinegar comes from Modena, Italy. These Vinegars are aged in mulberry & oak casks by master vinegar makers of Modena and infused with local fresh fruit. Apple Balsamic Vinegar: A delicate crisp sweet apple flavor that is a refreshing taste sensation on salads, glazes and grilled chicken, pork and fish. Drizzle over sliced apples, fruit or goat cheese. It pairs well with any of our extra virgin olive oils. Blueberry Balsamic Vinegar: Infused with Blueberries and barrel-aged up to 6 years, this Traditional Balsamic Vinegar is sweet and has a unique flavor and can be used in cooking as a replacement for wines or dress up your salad dressing and sauces. Try drizzling over ice cream for an explosion of flavor! Chocolate Balsamic Vinegar: Olive Pit Chocolate Balsamic Vinegar is aged together with South American pure Cocoa in cherry wood barrels. 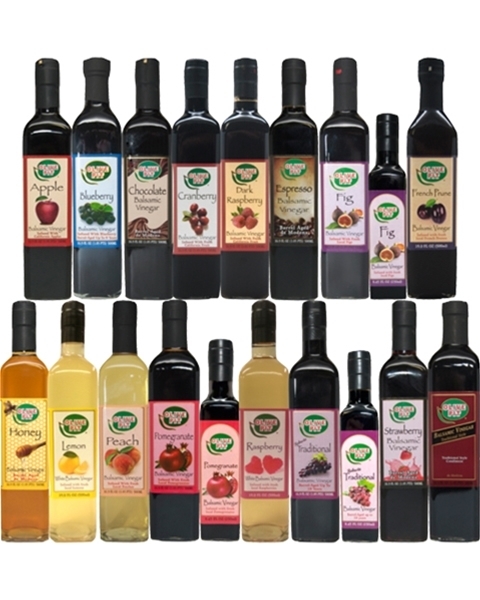 Use this exquisite vinegar drizzled over fresh cheese, strawberries, spinach salads, yogurt, waffles, game meats and ice cream. Coconut White Balsamic Vinegar: This delicious treat explodes with aroma and taste of fresh sweet coconut. Thai cuisine - add soy sauce and garlic olive oil. Use in dressings, marinades, shrimp & chicken dishes. Pairs well with lime olive oil. Drizzle on ice cream & desserts! Try a splash in your next drink. Cranberry Balsamic Vinegar: A wonderful combination of fresh and dried cranberries and spices blended with our Traditional Balsamic Vinegar. A deep glossy color and strong finish with velvety undertones. This blend creates a tasty accompaniment for many dishes. Enjoy over cheeses, on toast and muffins or use with pork, turkey and alongside chicken dishes. Dark Raspberry Balsamic Vinegar: Olive Pit Dark Raspberry Balsamic Vinegar is deliciously sweet, fruity, mildly acidic, and beautifully blanced. A wonderful indulgence of raspberries combined with our Traditional Balsamic Vinegar will awaken your senses with its rich full-bodied flavor and vibrant aroma of fresh raspberries. Use to marinate chicken, drizzle over salad greens, with nuts and goat cheese, or top a spinach salad with red onions and warm bacon. Serve as a finishing touch on ice cream topped with chocolate sauce, dessert dishes and poached fruit. Espresso Balsamic Vinegar: This rich and savory aged espresso balsamic vinegar from Modena is exquisite on roasted meats, fresh soft cheeses, fruit like pears or peaches and waffles. Drizzle on a steak topped with blue cheese or desserts like strawberry parfait topped with shaved dark chocolate. Fig Balsamic Vinegar: Picked fresh from a local ranch, the figs are sun dried and infused with premium Aged Traditional Balsamic Vinegar. Use in salads or as a marinade. Mix with Olive Pit Extra Virgin Olive Oil to create an awesome dipping sauce. French Prune Balsamic Vinegar: This rich smooth flavor is perfect to use on salads or as a marinade. Mix with Olive Pit olive oil to create a dipping oil also great as a dessert topping..
Honey Balsamic Vinegar: No artificial flavorings or additives this rich and sweet vinegar has a fruity aroma and delicate flavor, perfect on salads, fish, poultry, roasted meats and sauces. Try drizzling over fresh goat cheese or vanilla ice cream. Lemon White Balsamic Vinegar: Our Lemon White Balsamic Vinegar is perfectly balanced; light and refreshing infusion of sweet lemons and white balsamic vinegar. Splash some on your next green or fruit salad, drizzle it over ice cream, desserts, roasted meats, fish or use it in marinades. Peach White Balsamic Vinegar: We take white balsamic vinegar and infuse with fresh peaches and has a fresh fruity taste for an extraordinary experience. Use in salads, on fresh fruit, drizzle on ice cream or in marinades. Pomegranate Balsamic Vinegar: This Traditional Balsamic Vinegar is infused with fresh local pomegranates. It has a fresh fruity taste for an extraordinary experience. Use in salads, glaze lamb, beef or duck. Drizzle on ice cream, in milkshakes and use in marinades or finishing sauces. Raspberry White Balsamic Vinegar: This white balsamic vinegar oozes with the natural flavor of fresh ripe raspberries and is deliciouly sweet, fruity and perfectly balanced. This rich full-bodied vinegar is perfect to use over mixed greens and a little feta cheese. Drizzle over fresh fruit or strawberries, use as a marinade or glaze for chicken or pork. Our Traditional Style Balsamic Vinegar: This all natural sweet and thick vinegar comes from Modena, Italy. This balsamic vinegar is perfect paired with any of our extra virgin olive oils, for dipping fresh bread or drizzling over garden salads. We recommend trying this in meat marinades, sauces, or even pouring over warm apple cobbler with vanilla ice cream. Robusto Traditional Balsamic Vinegar Aged 18 years: Our Robusto Aged Traditional Balsamic Vinegar is from Modena, Italy and is made from grape must from Trebbiano grapes under the strictest conditions, as are all good balsamic. It is aged up to 18 years in Oak barrels, Mulberry or Juniper. This thick sweet vinegar has a robust flavor and is great combined with one of our Olive Pit Extra Virgin Olive Oils for dipping or on salads. Get creative; the possibilities are endless when using this delicious vinegar. Strawberry Balsamic Vinegar: Our Strawberry Balsamic Vinegar starts with perfectly picked and ripened strawberries, then crushed, left to ferment naturally and blended with balsamic vinegar aged in oak barrels. We recommend it on grilled meats, fish, salads, ice cream, fruit salads and soft cheeses. No artificial flavorings or additives. Vanilla Balsamic Vinegar: A delightful sweet and smooth vinegar that will give your salads or fruit an exclusive taste. Try drizzling over goat cheese and makes and ideal marinade for meat, fish, vegetables when paired with any or our citrus olive oils. We were driving back from Redding CA so we decided to stop to get something to eat and we found Olive Pit store at Corning CA. We were browsing in the store before we got lunch so we tried a few balsamic vinegar. We found one that we loved Robusto Traditional Balsamic Vinegar. We highly recommend this one! You will love it! I am a chef at a Turkish restaurant in Rocklin CA. The owners/bosses eat pomegranates religiously..the head chef is always making salads for her family and very picky about her dressings. One day last year I was driving back from Oregon when I decided to stop at the Olive pit, where I had stumbled across the Pomegranate Balsamic vinaigrette. I gave it to the family as a gift and she absolutely fell in love with it saying it was one of the best balsamic she has had in the US since leaving Turkey. This year while returning from my yearly vacation in Oregon I came back to the Olive pit and got them another bottle but this time I also had a new girlfriend who absolutely loves lemons and doesn't have a sweet tooth. I decided to pick her up the lemon white balsamic vinegar and she too really enjoyed it. I'm really taken by how wonderful this store as it is one of my favorite store to shop at. Thank you for having wonderful items and many varieties to choose from. -sincerely James J.
on 9/19/2017 Honey Vinegar for Soups - a whole new level! Splash a good dose of the Honey vinegar into a pot of soup (recommend chicken and sausage with a sweeter note) for an amazing taste! on 4/18/2017 Turn traditional recipes upside down! I have purchased the honey and the chocolate balsamic vinegars. My favorite use of the chocolate one is on my strawberry spinach salad. You don't need a lot, just a drizzle, and the flavor is wonderful.The contrast in colors make it look gorgeous! I use the honey vinegar in many recipes that usually call for vinegar. It has a subtly sweet taste that is delicious in coleslaw!